THis map shows the location of ACP’s proposed air compressor station in relation to houses in the Union Hill community. Source: Southern Environmental Law Center. The State Air Pollution Control Board voted 4 to 0 last night to approve a controversial natural gas compressor station in Buckingham County that is crucial for the operation of the Atlantic Coast Pipeline. Pipeline foes had argued that emissions from the compressor station would create a health hazard for nearby residents, a majority of whom, depending upon what mapping criteria are used, are African-American. This disproportionate impact upon a minority community, many contended, amounts to environmental racism. But Dominion Energy and state regulators countered that the compressor station will be the cleanest in Virginia, emitting 50% to 80% less air pollution than any other gas compressor station in Virginia. “The bottom line here is the Buckingham Compression Station will be the most stringently regulated compressor station in the country and the public’s health will be protected,” said Michael Dowd, director of the Department of Environmental Quality’s Air Division, as reported by the Richmond Times-Dispatch. As happens so often in such debates, there was no meaningful discussion of the level of risk associated with the project. Regardless of how tightly regulated the station is, how much pollution will it emit? And what health hazards are associated with that level of pollution — are they real or imagined? Numbers may exist deep in the bowels of the DEQ, but they have not surfaced in the public debate. What pollutants are people worried about? The most detailed discussion I have seen comes from the Southern Environmental Law Center, which overs legal and regulatory aspects of the compressor station. The Sept. 21, 2018, letter, submitted to DEQ’s Dowd and members of the air pollution control board, notes that compressor stations, generally speaking, emit carbon dioxide, carbon monoxide, methane, nitrous oxide, volatile organic compounds (VOCs), and particulate matter. Some VOCs, such as benzene and formaldehyde, are carcinogens. Aside from carbon-dioxide, which is implicated in global warming but is neither toxic nor carcinogenic, the SELC letter focuses mainly on three pollutants: NOx, a contributor to low-level ozone, which at high concentrations aggravates the lungs; and formaldehyde and hexane, which at high concentrations are carcinogenic. The public deserves to know the maximum predicted ambient air impacts that could occur due to the Buckingham Compressor Station, and VEDQ has an obligation to ensure that [national air quality standards] will not be violated as a result of allowing the Buckingham Compressor Station to be constructed. Thus, VDEQ should not ignore the much higher NOx emissions that could occur, even if infrequently, during times when temperatures fall below zero degrees Fahrenheit. The letter also argued that the Dominion modeling “understates worst case impacts” for formaldehyde, and had not conducted an cumulative impact analysis of hexane. But how dangerous is the stuff? The SELC letter puts the onus on Dominion and DEQ to prove that the compressor station is safe. SELC itself offers no analysis of the odds that Union Hill residents might suffer from breathing difficulties from NOx or the odds of contracting cancer from formaldehyde or hexane. Are Union Hill residents truly at elevated risk? Gradient, a Cambridge, Mass.-based consulting company, conducted an analysis of two compressor stations proposed by the Millennium Pipeline Company for Sullivan County, N.Y. Drawing upon air measurement data published in peer-reviewed scientific studies, government reports, and Environmental Protection Agency databases, the study focused on VOCs, including formaldehyde. By way of preface, the study noted that total VOC exposures for the compressor stations represent “a hypothetical worst-case exposure scenario because they assume that the exposed person is present outdoors at the maximally impacted location 24 hours a day, 7 days a week, and 365 days a year.” Needless to say, that is a highly unrealistic scenario that applies to no one in the real world — certainly not to residents of Union Hill — and overstates the real risk. Spending about 2 hours and 45 minutes in a room with new wood laminate flooring. If the risks associated with the Hancock compressor station are roughly comparable to those of the Buckingham station, we’re talking about risks that people voluntarily expose themselves to every day. Broiling fish in an electric oven? Applying facial moisturizer? Nobody to my knowledge is agitating against electric ovens and facial moisturizer. Still, the Gradient study does not translate those activities into increased incidence of cancer per 100,000 population or any other yardstick comprehensible to the public. Maybe spending 45 hours outdoors in New York City is a really bad idea! Or maybe the risks in the 200-resident population at Union Hill are too small to measure. A poorly informed debate. Neither side of the debate has seen fit to present the data in a way that would inform the debate. I suspect that the pipeline foes know that the elevated risk would look ridiculously small, while Dominion is loathe to concede an elevated risk of any kind. I am surprised that the idea of using electric-motor compressors rather than natural gas compressors never came up during the debate. I’m just speculating, but I’m guessing that pipeline foes had no interest in advancing a genuine solution to the problem. Their real goal is to kill the pipeline; their concern for racial justice is purely rhetorical and tactical. I’m surmising that Dominion didn’t volunteer the idea because it didn’t want to run the chance of delaying the pipeline project by revising the permit application and undergoing another round of regulatory hearings. Whatever the case, in the absence of such numbers, the public is left with nothing but talking points and hyperbole. And so, it seems, were the deciders, members of the Air Pollution Control Board, who, based on press reports, never asked the obvious questions. What a shame. This entry was posted in Energy, Environment and tagged Atlantic Coast Pipeline, James A. Bacon. Bookmark the permalink. Thank you for getting somebody to share that map, which does indicate at least some of the homes are quite close to the boundary of the new facility, but others pretty far away. It also shows, as I knew, there is a long-standing existing pipeline running through the region, and the compressor station is all about that intersection. This argument is just a proxy for the larger anti-natural gas push. Just a short while back natural gas was a Great Thing (Obama deserves credit for the pivot) but now its suddenly a Terrible Blight. Just like security along the southern border. Consistency is too much to ask of any politician, but it seems the hard left is totally unfamiliar with the concept. Obvious question looking at the map – why does it have to be so close to houses? For myself, natural gas itself is not a blight but if it is a for-profit project for economic development it does not meet the “necessary” justification for eminent domain and should be required to negotiate willing buyer/will seller like any other for-profit venture. There is already gas available for electricity – via the existing Transco lines and you don’t need to run a pipeline to eastern Virginia to feed gas turbine plants that can be anywhere on the grid near existing transco pipelines. I’m not against the project and not against natural gas but unlike those who claim they support private enterprise and oppose govt-subsidized ventures – I see this as a government-subsidized venture that is wholly unjustified. Dominion is basically exploiting loopholes in the eminent domain laws to take others private property without their approval – for a for-profit venture solely to benefit the investors. “… Critics say Dominion’s choice of the Union Hill area in Buckingham County for a noisy and potentially toxic industrial facility would disproportionately affect minorities — something state law prohibits. Both former members — Samuel Bleicher of Arlington and Rebecca Rubin of Fredericksburg — were removed from the board in November by Gov. Ralph Northam (D) just as they were poised to act on the issue. Neither has said how they would have voted. The state Department of Environmental Quality and Dominion have said that the area around the proposed facility is predominantly white, but they used broad census data instead of an actual head count. Better data has come from an anthropologist affiliated with the University of Virginia who conducted door-to-door research in the area, Rubin said in a separate interview. Using the research by anthropologist Lakshmi Fjord, “you don’t have to extrapolate anything,” Rubin said. “It’s very clear and excellent data . . . to quantitatively show that it is in fact a historically black community.” The board should let that guide its vote, she said. “In order for environmental justice to mean something, it has to mean something when crucial decisions are being made,” said Rubin, who published an op-ed online Monday in The Washington Post. Fjord, a visiting scholar at the University of Virginia, spent more than two years gathering data from residents at their homes around the compressor station site, an area known as Union Hill. The community was settled shortly after the Civil War by free blacks and former slaves. Stephen Metts, a researcher on the adjunct faculty at the New School in New York, said he has spent several years mapping demographic data for similar pipeline projects across the country, and Union Hill is “by far the strongest” case he has seen. Dominion contends that its own data is “the best available . . . because it is unbiased,” company spokesman Karl Neddenian said via email. He said Fjord’s data is flawed because it “included only certain households on select streets” to create “a false assessment of the racial demographics of the area.” Neddenian also said that some of the aerial images used to analyze the population incorrectly labeled garages, barns and other unoccupied structures as homes. Dominion has pledged to spend $5.1 million on various improvements for the area, such as building a community center, buying an ambulance and beefing up 911 services. Larry, first, the compressor station is put where the lines cross, so the question is, why do the lines cross there. It’s pretty clear from the map that the developers have jinked the line around to avoid houses or other sensitive locations – it not the straight shot you see with the older pipeline. Anywhere it went, the opponents would have found some basis to challenge it! Steve – take a look at that map guy… why did the pipeline get drawn right where there are houses and not where there are no houses not that far away from Union Hill? Let’s look at another map and let me ask why they changed route there but can’t at Union Hill? I have no idea about Union Hill, Larry. 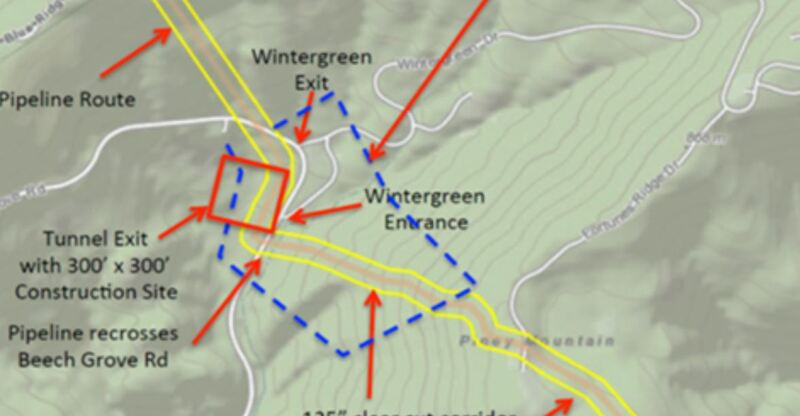 I know the mountainous terrain dictates much of the layout around Wintergreen. I assume changing the route to avoid Union Hill entirely would have upset somebody else or created other problems. It ain’t a zero sum game. The path of NO resistance can’t be found, you just hope for least resistance. I think the impetus for changing the route around Wintergreen appears stronger than for Union Hill. I’m looking the the houses around Union Hill and if you go out 2-3 miles there is a lot less density of houses. Did they try as hard to avoid impacts with Union Hill as with Wintergreen? Was there a lot of money for a legal challenge from Wintergreen property owners and not so much with Union Hill property owners? I do not side with the obstructionists and NIMBY – at all – but I do think trying to avoid settled communities is not unreasonable. They’re not legitimately entitled to eminent domain to start with. The only they’d be justified is in there was a critical need for gas AND there was no other providers, much less an existing one like Transco. This is not only a for-profit venture but it’s a competitor to other existing pipelines. Dominion chose the location. It was one of two pieced of land in the area where they purchased land for far above the price that’s typical for the area. The other site is larger so they’ve have been farther from homes. They did not appear to look for a site that truly had no close houses. However, they are trying to force on of the African American direct slave descendants to sell them more land to increase the size of this tract. The Transco is actually 4 different pipelines but not under the level of pressure or anywhere near the size of the 42 inch ACP. Because they will be able to send gas on the Transco which connects directly to their Cove Pt. MD LNG facility, we believe a lot of gas will go there. No verifiable additional uses for gas in Virginia have been identified although they assure us that there will be thousands of jobs and millions of dollars of return to someone. Since the Transco has been in the area for so long and has not brought a local distributor to allow residents or businesses to use gas, no one locally honestly believes there will be new business from this. Buckingham has many tracts of timber that raise trees for large international companies. There should be a tract where they could have put this so that very few people were affected. Our system does a better job of protecting our trees than people. They especially liked the location along the Transco for this piece of land and part of the reason it’s such a big problem is because they bought, at an extraordinary price, the former plantation house site from absentee white owners. The former slaves were able to buy land around the area and many of the current owners are direct descendants. Many families gather here regularly. Many leave the area to get employment but return regularly and also retire here. There are also two historic African American churches that were established when their members moved from the outside meeting places at the nearby white church. No true indepth study was done through the official process. Census tract data is not effective for finding hot spots like the community around this compressor station. However, the reviews done before decisions were made were of the windshield variety. Those looking for heritage and features to avoid looked quickly and from a distance – they didn’t want to find anything that would get in the way. If they’d done a close look early in the process, if they’d sincerely reached out to the community and attempted to address people’s concerns – make changes to help reduce the impact on the people like they say they do – we’d be in a different place today. The system is designed so that while it appears that exquisite detail is considered, in truth decisions are made without true specific data because it’d have to be financed by the company. No government agency does that level of data collection. Also, the “rules” are mostly unwritten. The company has a lot of latitude and the project review begins long before everything is known. A number of decisions are made when required data are not yet due. FERC works hand-in-hand with the industry but landowners and affected communities are kept at arms length or worse. Nothing in the rules requires the company to do anything at all to consider landowner use of their land or landowner concerns. The company alone gets to decide who it will make changes for and who it will not. Overall, for all the talk about oversight, our country has never provided the federal safety agency sufficiently that it could do its job. Congress directed it to focus on populated areas instead of funding it. Today, the safety system is focused on the potential dollar losses to the industry, not the landowners. Those living near this infrastructure in rural areas have much higher individual risk of loss than those in urban areas. These pipelines are being built under safety law designed for much smaller diameter pipes and much lower levels of pressure. New federal law was passed more than 7 years ago but it has never been put into effect by PHMSA – the industry has refused to agree upon the regulations. Thus, we’re effectively dependent upon the “good will” of the industry for our safety. Just today we got word that a segment of proposed regulations will be delayed since the federal government shut down when the committee was to meet this week. Every week it seems that we get word about more reductions in environmental protection. Those of us forced to live with this infrastructure are promised safety and environmental protection. However, we have no way to ensure that we get it. Tax cuts and deregulation of industry take away our protection and our hope of protection. If we’re going to be forced to give up our dreams and to live with the constraints of this infrastructure, it seems we deserve safety and environmental protection. There is a lot of information withheld from us and we have learned that the system is designed to sacrifice us. The things I’ve learned about landowner rights and so much more through this process convinced me that no one has any motivation to work hard to build anything because it can be taken away from you at any time and government will help. There’s a lot wrong and it’s well beyond this issue. I am not sure whether that is the issue. It certainly could be, but there is a bigger problem and that is the data. Yearly averages are not an appropriate measure to determine individuals’ health risks which increase during episodes of high exposures. Exposure levels that are averaged over the year might meet established exposure levels but “an exposure to blowdown concentrations of contaminants would have different health implications than a long-term lower level exposure (i.e. yearly average) to the same contaminants.” We just don ‘t have the data for high levels of concentrated exposure although analysis of people living near compressor stations have exhibited health issues. “I see no realistic chemical exposure/cancer risks.” and Jim’s title of ‘fact poor’ debate is true but here is why. Because “to date there have been no epidemiological studies performed to identify health impacts from compressor stations.” That lack of data in addition to the wrong measurements stated above. Then there are the VOCs all known to be highly toxic. Examination of published air emission measurements shows the very real potential for harm from industry emissions like benzine and formaldehyde. EPA has classified benzene as known human carcinogen for all routes of exposure. Formaldehyde is also considered a Hazardous Air Pollutant (HAP) by the US EPA (EPA). According to these reports, compressor stations are the highest UNGD source for formaldehyde. So…. I see more capitalists gone crazy with complete disregard for anything but their profits. They are going to turn us all into full blown socialists if they don’t take ‘community’ into consideration soon. One potential danger is presumably rupture of the pipe and fire, for example this recently happened south of Pittsburgh when the heavy rains of late undermined/washed-out the ground beneath an older pipeline. There was a big fire but apparently far enough away from the nearest house (which was not too far away). But presumably the pipeline is following the existing regulations, with always the question if the regulations are adequate? That would be “old” news though. >>But the brand new news is Virginia environmental groups are requesting that Virginia should adopt very strict state methane leakage regulations for pipelines to prevent what they see as the threat of methane-induced climate change. I am actually philosophically supportive of reducing methane, particluates, and other pollutants that may be complicit in causing probelms for the planet. In other words, I am a little less tunnel-vision on CO2 reduction, but would like to see more focus on other contaminants. But obviously I would not be looking for harrassing type regulations mainly to try to stop projects. I see no realistic chemical exposure/cancer risks. Mainly accidents and methane emission standards. I’m philosophically opposed to giving eminent domain powers to a for-profit company that will sell it’s product to the highest bidders. Emminent domain is an issue I do not see clearly on, I realize siting may be difficult or prevented by landowners and politics. I am not sure what the correct answer is. As you state, utilities in the USA are companies that are guaranteed to recover their costs and profit margin. On a state level that makes them a partner with our state and our politicos get so say what kind of power plants we want, even it is enormously expensive. This case is multi-state, so I feel less like it is a local yocal influence to some preferred partisan pet energy project. But still a concern it is not free market. I think the fact that it’s a for-profit venture – AND one that is competing against other pipeline companies – undermines any real claim as a “necessary” need. It’s a plain old free-market project – and it ought to compete on that basis. First, pollution impacts: (1) A compressor station’s gas emissions, compared with industrial emissions generally, must not pose an unreasonable health risk to the public — but these don’t even come close to doing so. (2) Apart from the health risk, the greatest impact on quality of life from something like a pipeline gas compressor station is noise. If I had a home (or belonged to a hunt club) anywhere near this thing, I’d be mainly concerned about the noise. Why was noise not more of a concern, if not the principal concern, here? Second, the route: This compressor station is located where the ACP crosses the Transco Pipeline. Clearly that’s important because it provides a second source of gas for the ACP operator to use to restore pressure after servicing or in an emergency; otherwise he’ll simply use gas from the ACP itself. If you look for possible alternatives, it’s obvious that the ACP could have crossed Transco at locations a little further north in the middle of remote woodlands; yet the location chosen was in the middle of all these dozens of homes. Who dropped the ball, here? At some point Dominion finalized the ACP’s general route for regulatory/permit purposes and this crossing point became a given; but Dominion has been allowed to say, “Given the basic route, the compressor has to be located here.” Why was that compressor location not determined until after the basic route became a “given” — that is, why didn’t regulators (and Dominion itself) give the location of the Buckingham compressor station the attention it deserves way back in the early design and permitting stages? Here’s a map of the project and you can see, it’s pretty close to a straight line NW to SE across the Virginia Piedmont. Ditto on noise, and I have night noise at my house. To “help” this Fairfax has strict controls on overnight noise by residents. Of course, the limitation there is that noise from fellow residents is the least of my problems. re: ” This compressor station is located where the ACP crosses the Transco Pipeline” – yep – but they drew the line for the ACP and it could have intersection the Transco line anywhere.. Dom chose the path – it’s not like it’s the ONLY place it could cross. A key determinant in Dominion’s decision was finding an appropriate piece of property for sale. There weren’t many pieces of property for sale that met Dominion’s criteria. I think I read somewhere that another piece of property was for sale that pipeline foes say could have done the job. Apparently, it did not meet Dominion’s needs as well. But I have not researched this particular matter. I don’t know if we’re having a communication issue in this discussion or some are just taking Dominions view and portraying it as if they are facts. I strongly suspect that Dominion can and is determining the path of the pipeline including it’s facilities according to where they prefer unless strong opposition arises from communities or govt entities or the courts. They are not using willing seller/willng buyer transactions to determine the path of the pipeline. If they can and are drawing a line on a map and then intend on utilizing eminent domain for property whose owners don’t want to sell – what prevents them from also doing that for compressor stations? All of these comments, together with Jim’s post and the Washington Post Article, when you take all of this material together, it raises a whole slew of questions. Perhaps the overarching question, is why were not the most important real issues (noise, methane explosion, alternative locations, alternative compressor type,) never raised, or appropriately dealt with, in the process despite all the sound and fury over other issues that appear to be of far less relevance, to the real issues and possible practical solutions at hand. For example, was this a political battle, not one based on legitimate science, or quest for practical solution? Indeed were practical solutions given a chance to be discussed openly, and resolved in the best interests of all involved? Likely, too, this is a classic casebook study of what to avoid, and how to improve the process, should anyone be interested. That is another question. I will say this: Pipeline foes raised the gas explosion issue early on. Landowners made a big point of it. Even if the pipeline never exploded, they said, the mere threat would lower their property values. The ACP claimed the effect on property values is almost nil. Well, there is much we not know here, and much we do as to how this things work nowadays, but on face of it there seems that some reasonable chance of a better solution for all could of been had, had compromise been wanted. Many people today have lost the desire for compromise, we see it everywhere around us now. And all too often everyone loses. But maybe not, maybe the $5.1 million was enough when you can keep the grievance alive too. So everyone still loses. I think if Dominion were pursuing this in an ethical and fair-minded way – the opposition would be weaker and folks like be would not be near as critical. I’d like to see more gas available to places that do need it. But this pipeline bypasses a lot of places that could benefit it to go to where it would fetch a higher price – higher profits – that benefit the investors – and they’re using eminent domain to take folks property whether they like it or not. that’s just wrong. Lots of these places on the pipeline could ALSO use it to attract industry and provide more affordable heating for schools, hospitals and other community facilities- but no – it’s headed elsewhere. You should also know that there is only one person who is part of the group that accepted the $5.1 million for the community who has been truly involved from the start of this process. Most do not even live in the community and are not the front line affected people. The people who are fighting the pipeline are not allowed to participate in the process and damaging divide and conquer strategy will leave lasting damage. The first round of local meetings occurred during the work day and only invited individuals were allowed to participate. Others could attend, but not participate. The agenda was controlled and resulted in local influence on colors of buildings. The safety issues the community kept trying to get on the agenda was never and still has not been addressed. James Bacon: County residents DID ask for electric compressors instead of natural gas compressors. This would have required new electric lines from the nearby Bremo generation facility. The company refused to even consider this. You should also know that many promises have turned out to be empty. At the first community meeting they touted that every inch of the pipeline would be monitored by state-of-the-art broadband. Later, they removed that – using last Century microwave and point to point comparisons. After the first year, the facility will mostly be monitored hundreds of miles away in West Virginia instead of using local in person monitors. I’d like to know more about this. It sounds like a promising compromise. Dominion surely had reasons for opposing it. I would like to know what they were. Was the option more expensive? Would it have required resubmitting a permit and delaying the project? Why haven’t we heard more about this option? Jim – you’ve said that you need to “research” and “find out more” about some of these issues – but you’ve pretty much already defended Dominion and called out the opponents. I’d posit that these issues involving Dominion’s use of eminent domain and their behavior and conduct with regard to those affected by their proposal are important reasons why there is legitimate opposition and not just NIMBY. Once again – we have a for-profit venture not a public service corporation – using the power of eminent domain for a private company and it’s investors to take property from other people for economic gain for themselves. This is not a public necessity project. It’s a private for-profit business that is actually competing against other similar businesses like Transco and yet their behavior is more like the Govt taking land for a public purpose like a road or school. Jim – After all of this back and forth on confused claims, I am wondering if this is not a MANUFACTURED crisis. For example would all this sound and fury have flared up if this area had been populated by poor disadvantaged white people. If so, why not? What do the color of people skin have to do with this? Or who their kin were 150 years ago? Look at the photos of people who showed up at the compressor station hearing. Overwhelmingly white people. Only a handful of African-Americans from Union Hill. Draw your own conclusions. Many of the African Americans were seated. A good portion of the crowd was African American. Dominion luxury bused in a large contingent that took their seats and didn’t move. This meeting happened on work day. Lots of folks can’t take off from work for this sort of thing. Don’t think you can claim the African American population wasn’t adequately represented. Like almost everything else, Dominion shot it down from the start because they didn’t want the expense of building the power lines to do it. They make very fast determinations and then dig their heels in. At this point, I don’t think there’s any way to make that change. Personally, I want a route adjustment within my property and they told us nearly a year ago it was too late. Obviously it wasn’t too late but they aren’t willing to compromise or help reduce our losses or stress. We need to change this process. Eminent domain should not be so freely awarded to companies. Landowners should receive regular income for having the infrastructure on our property. If the infrastructure were a cell tower, the landowner would get annual income, proof of liability insurance coverage, and the company would pay the annual local property tax. Even landowners where pipe has been in place for years should get regular income whenever they are used for for-profit activities. All landowners should get more than a one time easement payment. FERC has an open docket on reconsidering its rules. Landowners sent in many requests. The industry said things are just fine. We’ll see what they do. Consumer and environmental groups are calling for Congress to review FERC. This post is typically disingenuous and pro-ACP. It seems to fault critics of the compressor station for not arguing facts. Then it goes into a bunch of odd comparisons and relative health impacts (reminds me of a military officer dipping his finger into a vat of Agent Orange and then licking it while telling reporters it’s perfectly safe). If there’s one hard-and-fast conclusion that could be drawn from this column — beyond the complaint that no one has done any serious risk analysis — it’s that the compressor station should have electrically powered compressors, if the goal is to minimize the environmental impact on Union Hill residents. Obviously, that’s not an option ACP wants to consider, for if it was, the company surely would have advanced it. Of course, foes of the pipeline haven’t advanced the idea either. Why? Because they don’t really want to solve the problem for Union Hill. They just want to kill the pipeline. So, I’d say the Union Hill controversy is largely fabricated. Does that make the post “pro-ACP?” Not at all — because the public has not been provided with the facts and analysis to evaluate the risks posed by the project. So, I can’t say whether the compressor station is acceptable or not. Of course, the level of risk posed by the project really doesn’t matter to you, does it? You’ve made up your mind that you oppose the pipeline, and the issue of risk analysis is mere distraction. Sorry Jim. Community members asked for electric. Several times in the original Special Use Permit county meetings. It was denied, just like the broadband monitoring of every inch of the pipe was taken away. You can’t say that’s the solution. It just isn’t. Much of the pollution comes from moving the gas from one system to the other and we know a lot of that will be done so they can export the gas. The systems are known to leak badly because they have no motivation to catch methane that escapes. Switching to electric would not resolve the concerns folks have about the place blowing up, about the lack of an evacuation plan, about wells being contaminated, and I could continue with things folks are worried about that have not been addressed. They TELL us it will be safe but they have proved nothing but that they can’t be trusted and will change what they promise at the drop of a hat. Oh dear …please see my post above re the problems with determining risks. Measurements of this type of risk aren’t done in a way that would make sense and compressor station risks have not had any real studies done. Re pipeline opposition .. Dominion seems unable to back off a decision that most probably will turn out to be a bad decision though it looked very promising 4-5 years ago. The situation has changed and the facts weren’t clear back then. Will Marcellus last 40-50 years? Many say half of that will be stretching it. Gas pollutes more than thought back then. Climate change is arriving faster than the scientists thought. We have the technology to leave fossils in the ground and it will be cheaper to do that. Using eminent domain for a pipeline whose need is based on easily csncelled affiliate contracts is outrageous … ETC! Jane Twitmyer: Agree. And there’s a reason the data are not available and thus research has not been conducted. The industry has kept anyone from collecting the data needed. If it’s not documented, it doesn’t happen. Then when you demand proof and none is available, you get to do what you want even if everyone knows it’s bad. We have the same problem with how this stuff affects farm animals and wildlife. No research. If suddenly after this stuff gets planted in our midst our cattle get all sorts of problems the company will insist it’s not their fault and we’ll just lose our business. That’s the way these things work. What stuff is hurting wildlife that has not been researched? Who is preventing anybody from doing research? We have very liberal university system spending billions if not trillions on R&D for climate change and alternates to fossil fuels. Jim, I am a bit dumbfounded about how you can say the Union Hill controversy is largely fabricated. Dominion did many things that are contrary to the way utility projects are normally sited. Sites for large utility projects go through a hierarchical sieve, if you will, that starts with the most crucial regulatory requirements and moves through to the less important ones. This process was not followed in the selection of the Buckingham compressor station. Once you determine that a site (or sites) meet regulatory requirements, then you evaluate those locations that can be purchased least expensively or with the least effort, such as dealing with only one or a few landowners. Dominion did it backwards. They bought the property then tried to convince everyone that it was a suitable location. Property zoned “industrial” was available in a nearby county that was adjacent to the Transco corridor, but Dominion elected not to use it. 2. The ACP could have intersected the Transco corridor at any point from the northern border of Virginia to its southern border. Virginia law requires the Air Board to consider the suitability of the site. The board appears to have deferred to the faulty decision by the Buckingham County supervisors. 3. Both the federal and state reviews require that a project determine whether it has an effect on environmental justice. In the FERC process, the ACP claimed that just a few families were affected by the siting of the compressor station. In its application to the air board, Dominion relied on data from a large census tract that greatly underestimated the number of residences and people that would be affected. An independent house-to-house survey conducted by a UVA professor revealed that at least 199 people (those who responded) lived within 1.1 miles of the compressor station, and that 83%of those surveyed were African-American. According to the Governor’s own Environmental Justice panel, this should have triggered an in-depth EJ review. The Governor dismissed his own panel’s final report and said that they were serving past their authorized date. 4. If such a review took place and determined that the facility did infringe disproportionately on the rights of the minority community around the site, it would have been considered unsuitable to receive the Air Quality permit. 5. After these basic qualifications had been met, then it would be appropriate to review the air quality issues, noise, etc. 6. When two members of the Air Board raised a number of questions about these issues, they were replaced by the governor for serving past the expiration date of their term. I think about 250 other members were serving on various other Citizen Boards around the state who were also serving past their expiration date, but were not relieved of their duties by the Governor. A lot of noise and manipulation was generated from this process. Dominion promised $5 million in local improvements after the pipeline was in operation. The lure of money divided what had been a cohesive community. The people of Union Hill have suffered in many ways from this process, and the facility is not even in operation. Because of the many lapses in this regulatory process, both by the applicant and the permitting agencies, we still do not know why Union Hill was selected as the site for the compressor station, other than Dominion was able to buy the property. That is not how the proper permitting of energy facilities is supposed to work. Citizens rely on their governments for basic protection under the law. They have not received it so far with the Atlantic Coast Pipeline. Tom, what are you implying here? That Dominion deliberately selected the Union Hill site because it was near an African-American community? Or just that it was oblivious to the fact that it was an African-American community? I have little knowledge about Dominion’s selection process. I am only pointing out that it did not follow the typical process that I am familiar with as to how large utility projects choose their sites or routes. It did appear that the ACP tried hard not to trigger an EJ review. Census data is often used as a first pass data set. But its shortcomings are well known. Census tracts have a large footprint, especially in rural areas, so site specific differences are lost in the averages. Since both the federal and state permitting processes have an Environmental Justice filter in them, Dominion should have known precisely what the number and composition of the residences were in close proximity to the compressor station. The regulator usually asks more questions when it appears that the applicant might be glossing over important details about a site. FERC, the governor and the DEQ all seemed eager to avoid the type of evaluation that is common in the permitting of energy projects at the state and federal level. I have been disappointed with the behavior of the applicants for gas pipelines, not just the ACP, but the MVP and pipelines at other locations as well. It is not unusual for developers to portray their projects in the most favorable light. But pipeline developers try to put lipstick on a pig and call it their sweetheart. Regulators are supposed identify these charades, not participate in them. I have been on the utility side of multi-billion dollar projects and know how intensive a by-the-book regulatory process is. They do not reward companies that try to take short-cuts. Federal courts are now identifying a number or areas where federal agencies failed to issue permits in a way that properly followed the law. This has happened for both the ACP and MVP. If a court challenge were to occur regarding the way the water and air quality permits for the pipelines have been issued in Virginia, perhaps those processes would be shown to have been incomplete in following all of the legal requirements too. I am speaking up because those responsible for protecting the public interest are not doing their job. If the proper questions are asked, and adequate data is provided and thoroughly evaluated, but permits are still approved, that’s one thing. It’s up to the umpire to call the balls and strikes. But right now the pipeline developers are throwing at the batter’s head and the ump is calling it a home run. Somebody has to say something, and many people are. As yet, not many are listening. I just hope those that are not listening don’t get hit in the head before we get the umpires some glasses. Sorry – I meant to say calling it a strike.